At Chewy, we realize how important your four-legged furry friend is to you, which is why we only carry the best in dog supplies, including dog food, dog treats and dog toys. 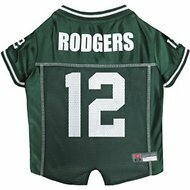 If you've been searching for green bay packers dog clothing & accessories, look no further. 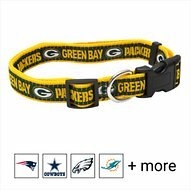 Among the wide selection we carry, one option to try is Pets First NFL Dog Leash. Key benefit: logotype ribbon with woven team logo sewn onto heavy-duty nylon webbing. 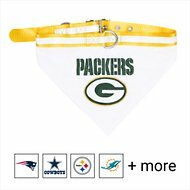 Another product is Pets First NFL Bandana Dog and Cat Collar. Key benefit: adjustable collar delivers a perfect fit for your dog or cat, while the reflective material adds visibility. Whatever it is you're looking for, Chewy has got you covered. Shop our wide selection of dog supplies today and treat your dog to a box of new goodies. 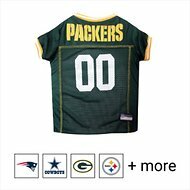 For all your pet needs including green bay packers dog clothing & accessories, Chewy has you covered! We're here for you.